Steven Salaita is being rewarded for his bigoted language. A settlement between the University of Illinois (UI) and former Virginia Tech University professor Steven Salaita was approved by UI's Board of Trustees Thursday. He will receive a lump sum payment of $600,000 and $275,000 in legal costs. In return, he will not seek or accept future employment by the university. 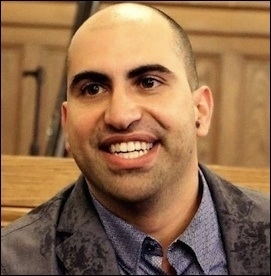 Thus concludes a saga that began in the summer of 2014 when the University of Illinois at Urbana-Champaign (UIUC) withdrew an offered position in its American Indian Studies Program due to Salaita's vulgar, Israel-bashing, anti-Semitic tweets. He sued the university and unnamed donors, alleging breach of contract and violation of free speech. Fashioning himself a victim of the "Zionist lobby" and a martyr to "academic freedom," Salaita soon became a cause célèbre, with speaking engagements and a standing ovation at the 2014 annual meeting of the Middle East Studies Association (MESA). His recently released apologia, Uncivil Rites: Palestine and the Limits of Academic Freedom, extends this theme. Salaita fashions himself a victim of the "Zionist lobby" and martyr to "academic freedom." In a fitting appointment, Salaita is serving as the Edward W. Said Chair of American Studies at the American University of Beirut (AUB) for the 2015/16 academic year. Discussing his move to AUB with Al-Fanar Media, Salaita spoke glowingly of his students' "particular awareness of Israeli colonization and the damage that Zionism has wrought on the Arab world," as opposed to "U.S. campuses" where, against all evidence, he claimed, "Zionism has long predominated." Nonetheless, Salaita complained that AUB is "expensive," "private," and "walled," with students who are "training to become upstanding members of the ruling class." Even worse for this boycott, divestment, and sanctions (BDS) advocate, the school refuses to "sever ties with companies who are profiting from the Israeli occupation." Apparently, American academe is more hospitable to BDS than that of Israel's pragmatic neighbor, Lebanon. Given Salaita's profitable new career as a hero to legions of poor, victimized anti-Israel activists and UI's hefty settlement, one wonders if he will return to the U.S. to teach? If so, universities can take a lesson from this affair: don't hire bigoted charlatans.